Komatsu Indonesia has had the capacity to produce frames to complete units since the establishment of the Fabrication Plant in 1992. The Cacing Fabrication Plant is producing mainly frames for in-house complete machines. All of the frames for our excavator products range from PC130 up to PC2000, Track Frame, Main Frame and C-Frame for our Dozer series, and Main Frame for HD series are also produced in this plant. The plant also produces booms for medium class excavators and big-size arms, in addition to supporting BKC (Bangkok Komatsu Corporation) for Super Long Front and KIPL (Komatsu India Private Limited) for Dump Truck frames. 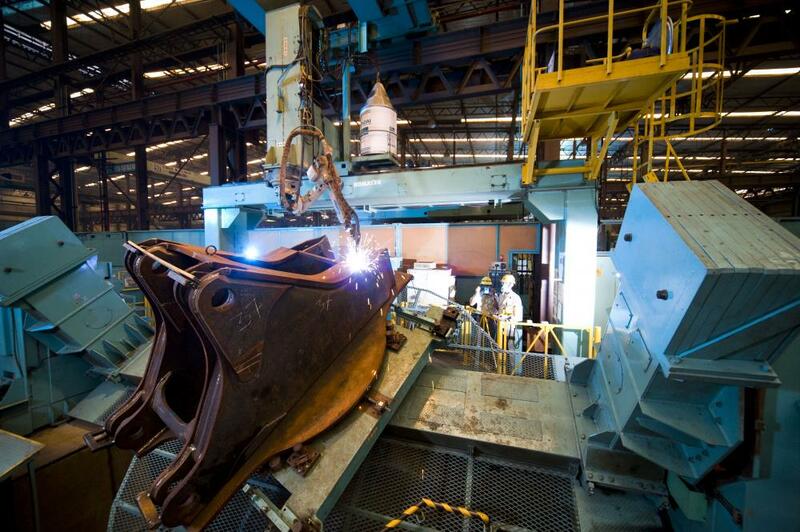 Welding and machining are the main activities in this plant. In addition to skilled and experienced welders, the plant also employs robotic automatic welding machines. The machining process is conducted by machines specifically designed to carry out machining processes of big-size components. To get component solidity required by standards, the plant also carries out Induction Quencing and Tempering (IQT). The maximum production capacity from Cacing Fabrication Plant is 2,000 tons per month.